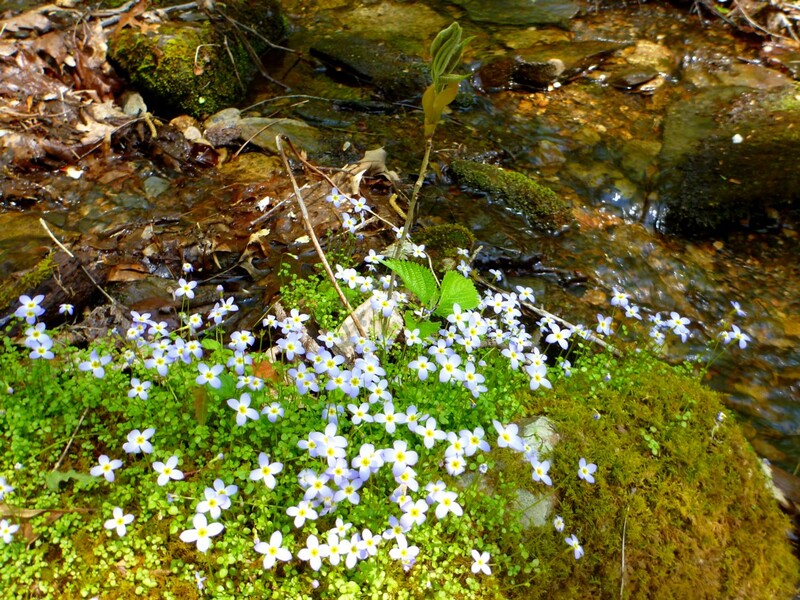 Posted by Jenny in hiking, nature, photography, Smoky Mountains. Flame azaleas already on April 29! 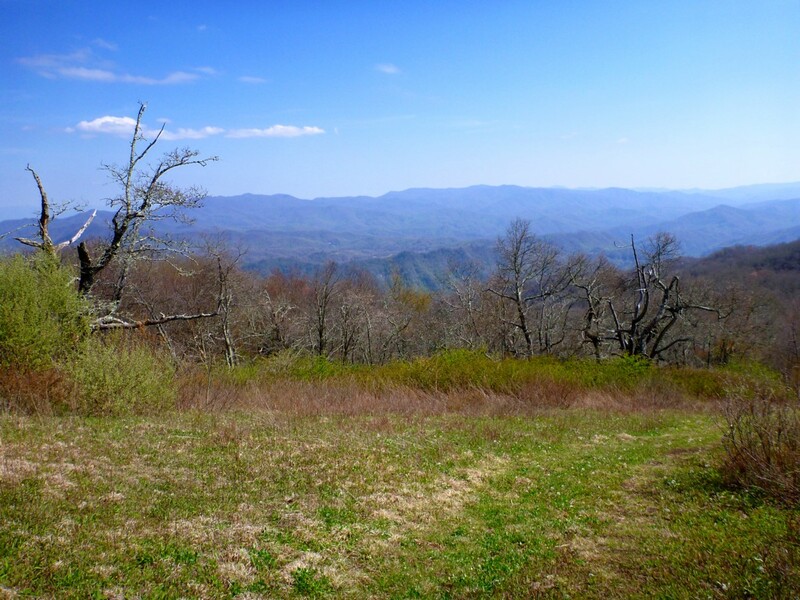 This was a leg-stretcher outing of seven miles and 2200 vertical feet, a mere baby of a hike compared to my outing that I called “Noland Divide From End to End to End”. 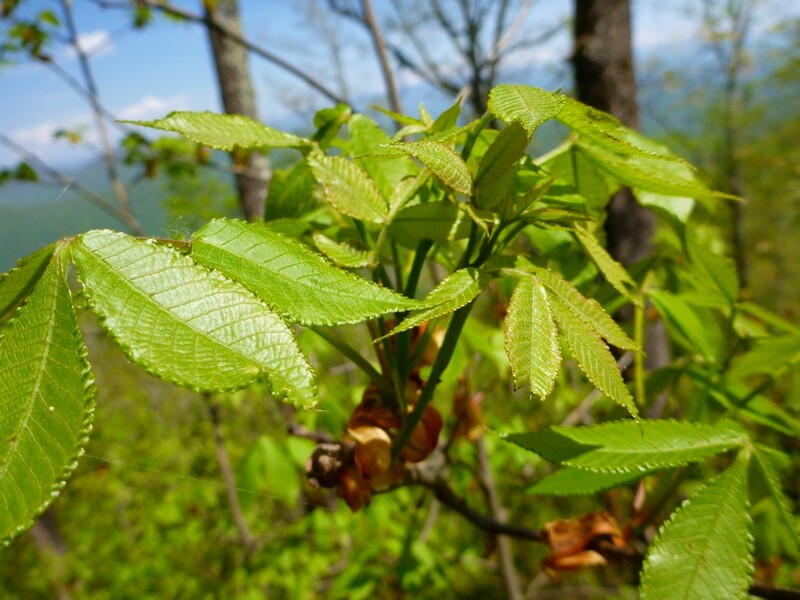 Sometimes when I hike, a theme emerges, and in this case it was “new leaves.” We will come to that in a moment. Like my recent Cheoah Bald hike, this one was started around 1:00 p.m. on a Sunday afternoon. It really isn’t ideal to start a hike in the heat of the day. But the same thing happened as two weeks ago. Being a person who needs a certain amount of solitude and quiet—mainly for writing, but also, come to think of it, just for existing—I find that Sunday morning is a kind of temporal sanctuary, the time people are least likely to disturb me. I relish that feeling of lingering in bed and rising to let my deeper layers of thought dictate my movements instead of the “I should be doing this, I should be doing that” layer of thinking. Then, around noon, I start getting restless and decide to visit my mountains. Taking full advantage of my new location near the south central gateway to the Smokies, I drove to Bryson City and the Deep Creek campground. I started at 1900′ and climbed to 4100′. 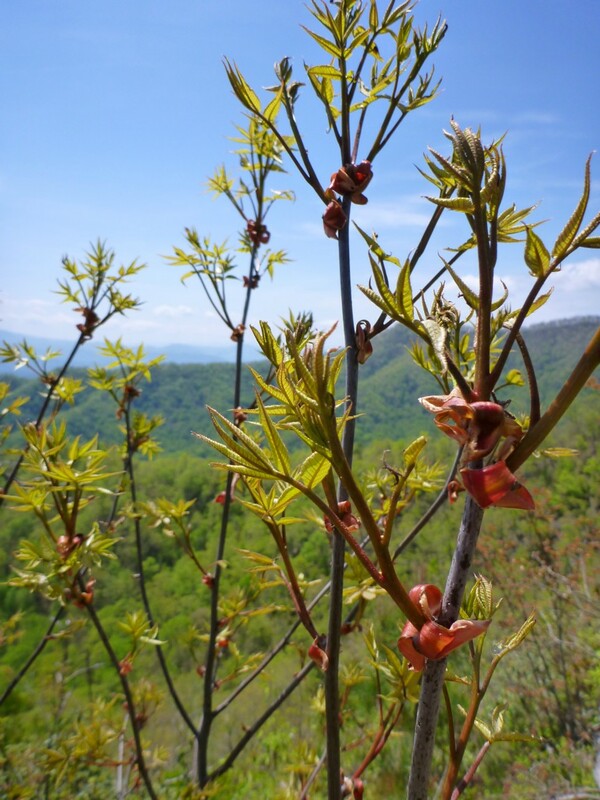 I spotted the azalea pictured at top around 2200′. 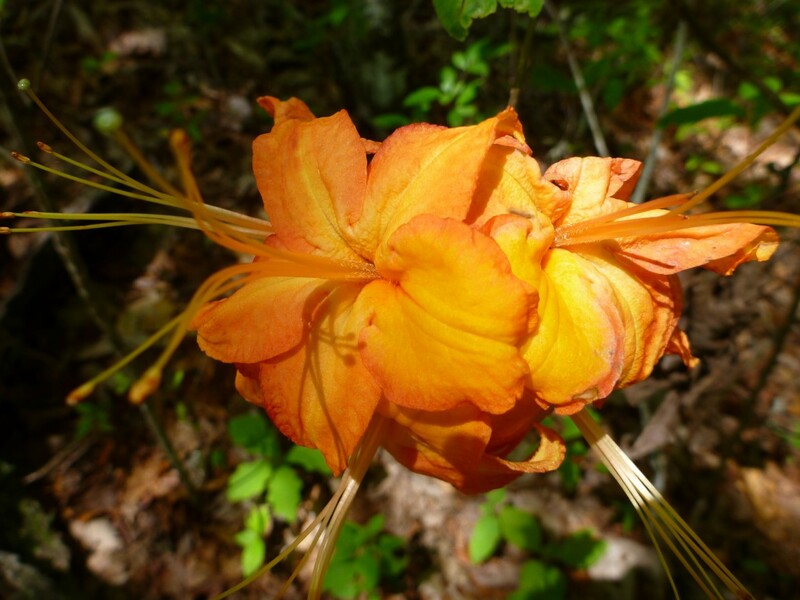 So the ones up on top of Gregory Bald at 5000′ must not be blooming quite yet, but they will surely be blooming way ahead of people’s regular azalea treks. I also saw laurel in bloom. Good grief! 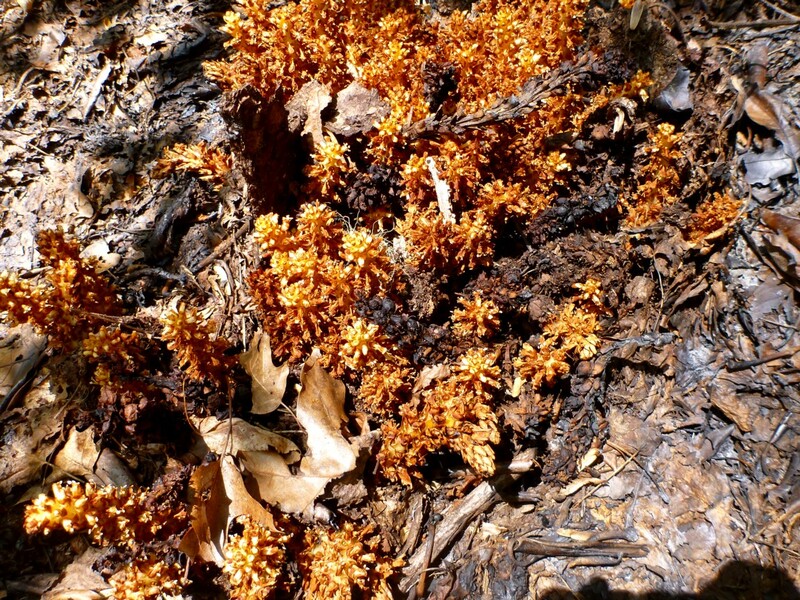 This warm winter has thrown everything out of whack. 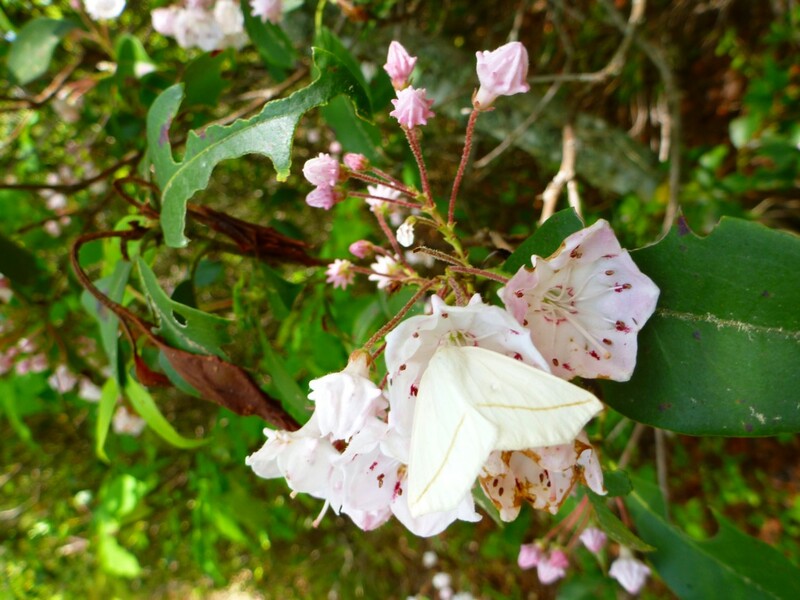 Butterfly on laurel. I like the faint stripes on the wings. I’ve noticed that every flower has a numerical identity. 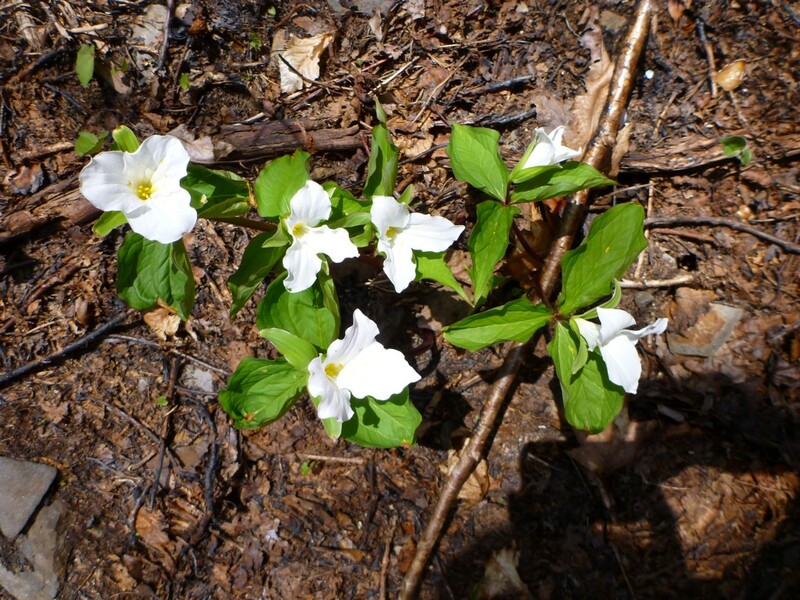 Trilliums are my favorite example, where every aspect, every layer of that flower comes in threes. With laurel, the number five is in ascendancy. 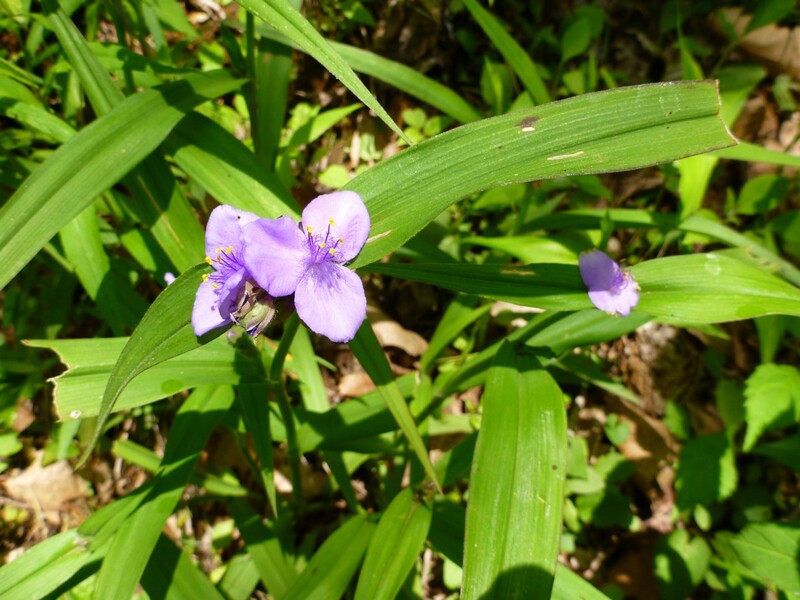 As I continued on, I spotted spiderwort, whose botanical name is Tradescantia, named for the traveler Tradescant who brought this plant back to Henry VIII after a voyage. A little below 4000′, I emerged on the narrow spine of Beauregard Ridge. I went up to what is called the “Lonesome Pine Overlook.” There is no single obvious pine at the overlook, just some scattered pines below, but perhaps the original pine is dead now. I had a view down toward Bryson City. 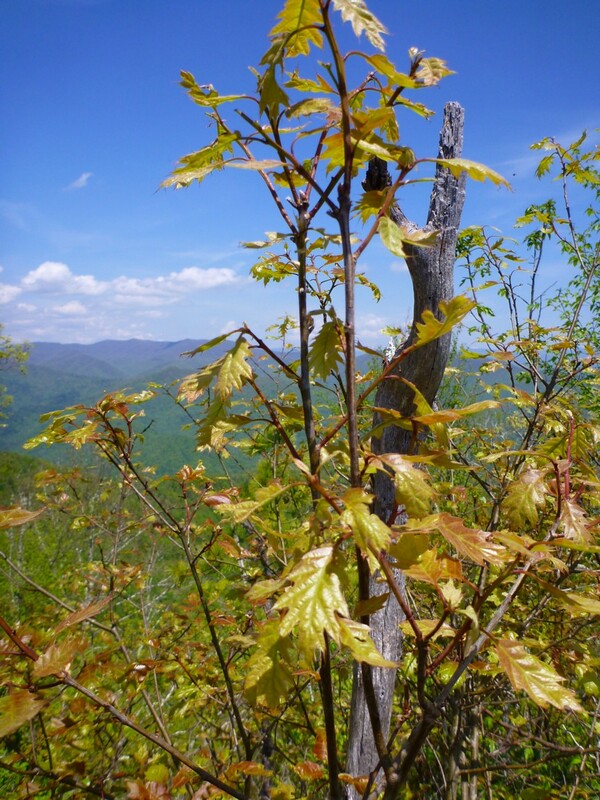 It was when I started back down that I noticed that here, around 4000′, it was still early spring. The warm weather has accelerated everything so much that I feel as though I didn’t get as much as I wanted of that tender, delicate stage of the season. 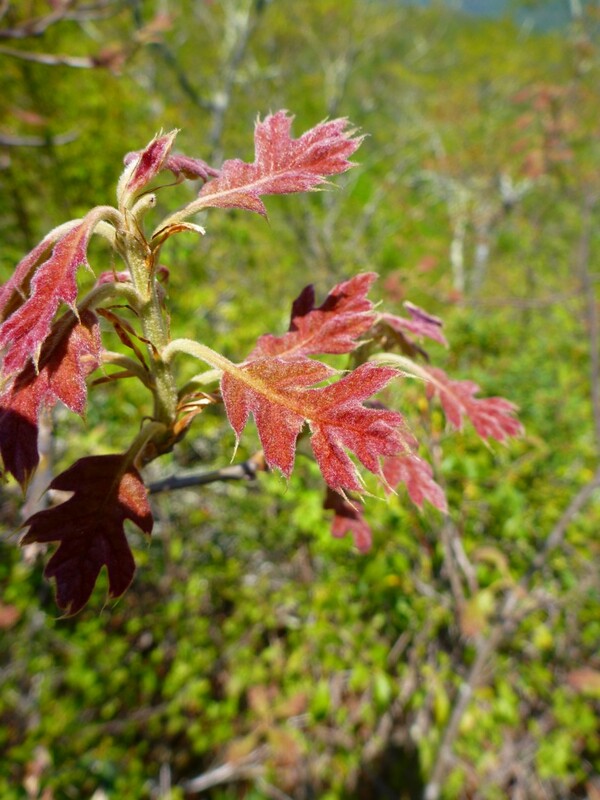 I noticed some tiny unfurling oak leaves, and then I started taking pictures of new leaves wherever they caught my attention. 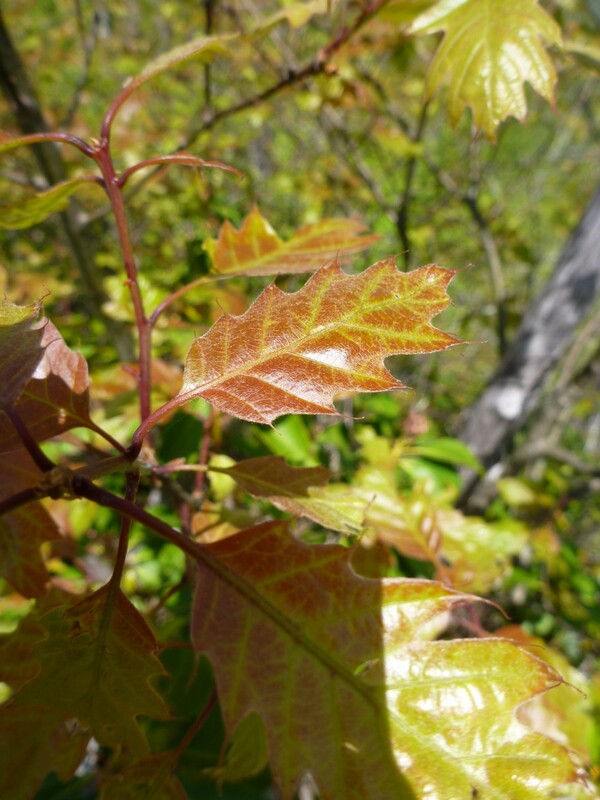 What follows is a portfolio of new leaves. 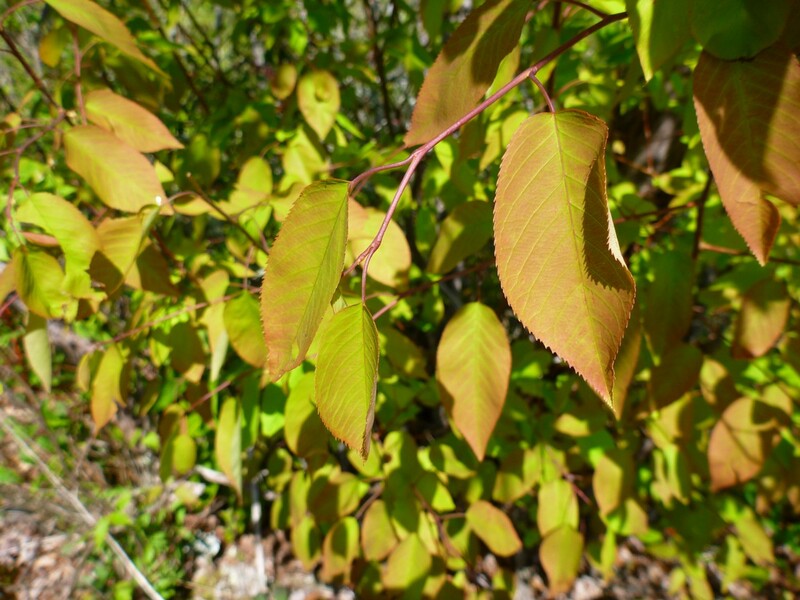 Some of the new leaves were glossy rather than furry. It is a blessing to be alive. 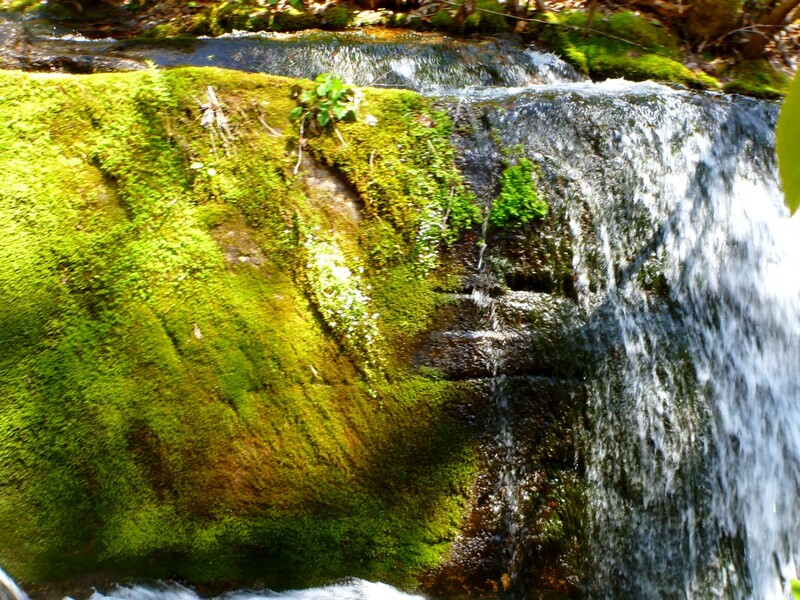 Posted by Jenny in hiking, Nantahala National Forest. I did this hike on April 14 and just now found the time to write about it. 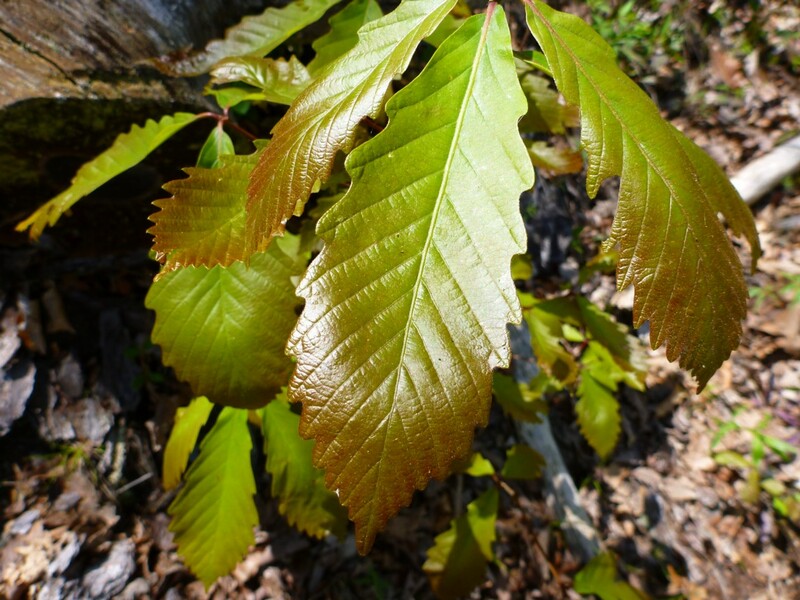 The Bartram Trail is a footpath that travels about 115 miles through north Georgia and North Carolina, named for botanist William Bartram, who explored the area between 1773 and 1777. His account of his experience, The Travels of William Bartram, was published in 1791 and remains in print. 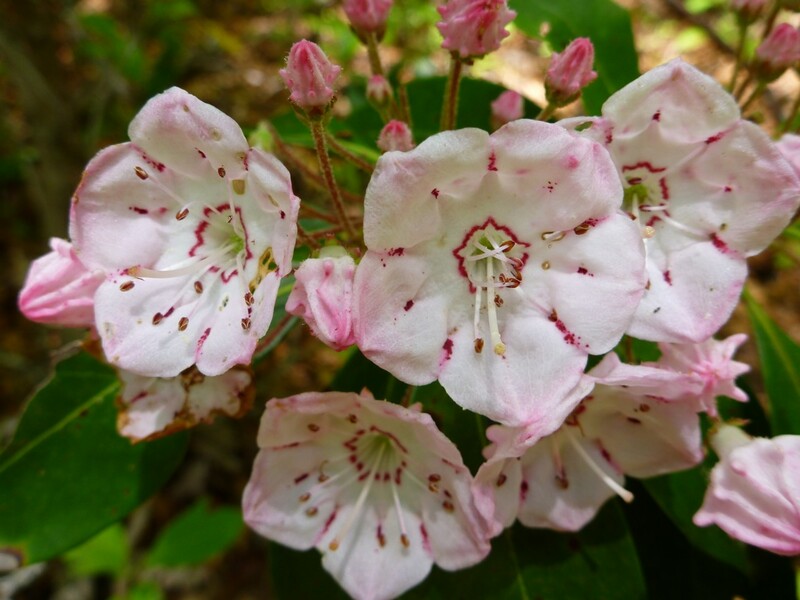 The North Carolina Bartram Trail Society was organized in 1977 and devoted many years building the NC portion of the trail within a corridor in Nantahala National Forest. It has now been completed. 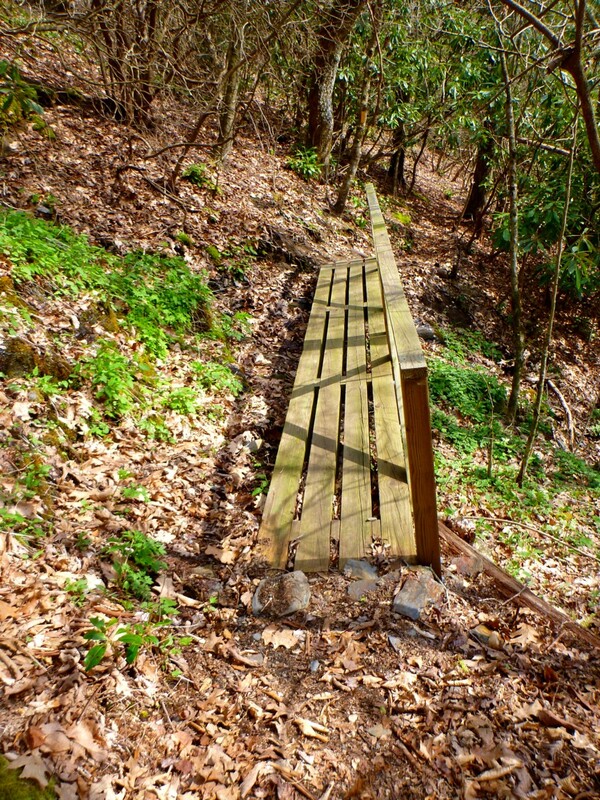 It features some elegant trail construction, such as this bridge that protects a steep sidehill section. I did this 10-mile hike on a warm Sunday afternoon, getting a late start and not beginning the climb until 1:00. I started at an elevation of about 2000′ in Nantahala Gorge. 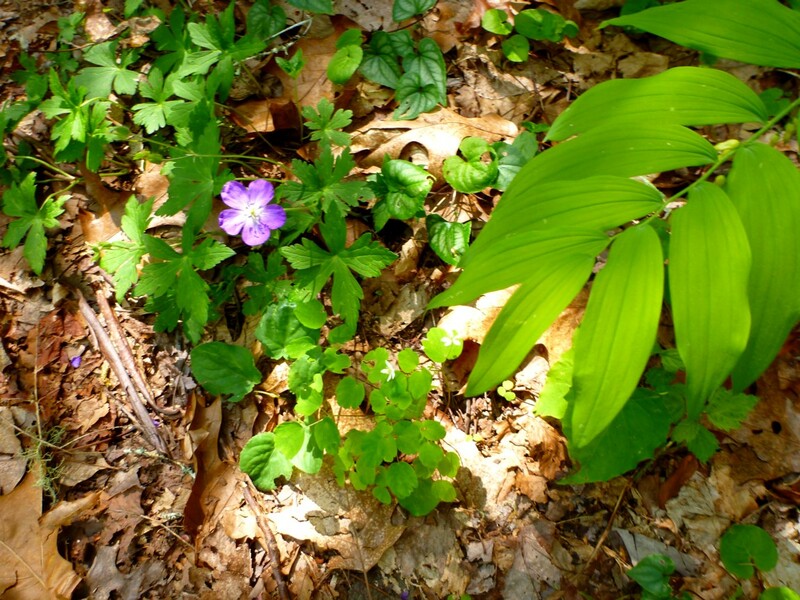 The endpoint elevation on Cheoah’s summit is 5062′, but the actual amount of climbing turned out to be closer to 3400′ because of a couple of significant ups and downs. Cheoah is the northern terminus of Bartram. The last time I set foot on its summit was in 1986 with the Smoky Mountains Hiking Club on a dual mission: to do trail work on the A.T. and to see Halley’s Comet. We camped out on the Bald and set our alarm watches for 4:00 a.m. for the best view of the comet, which was visible but partially obscured by haze. The A.T. reaches Cheoah in a longer distance than the Bartram trail, starting further north in the Gorge at Wesser and traveling up the infamous “Jump-up” and across Sassafras Gap. 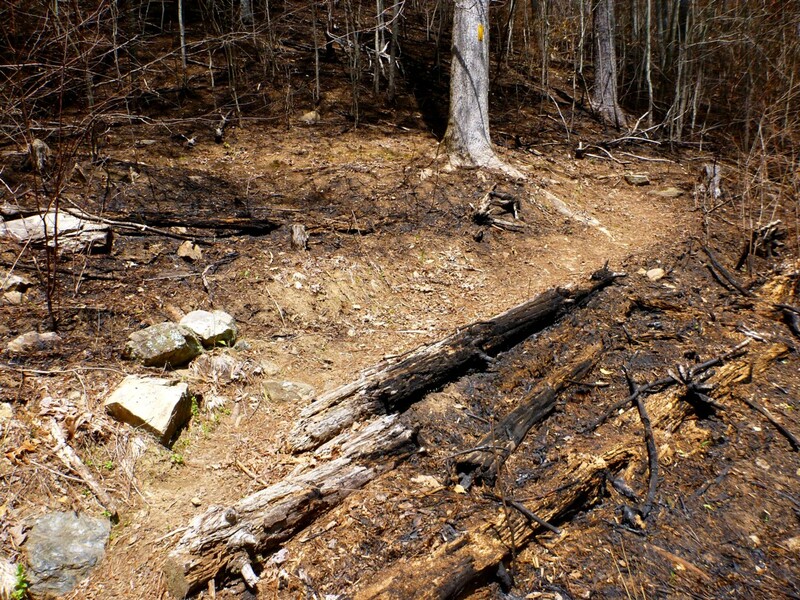 Once I crossed the highway and the railroad tracks across from the Winding Stair trailhead, I was greeted by the not-so-pretty sight of a large burned area. 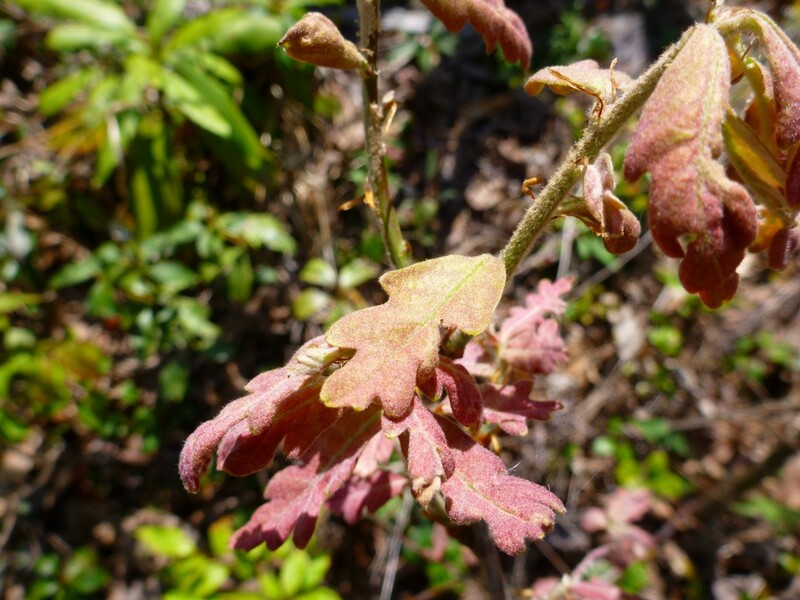 I believe the scorched areas I saw along the way were part of a program of prescribed burns, though unplanned forest fires have also sprung up in the area during recent dry weather. The burn and the high position of the sun in the sky contributed to an overly toasty sensation as I toiled up through switchbacks to get up the steep wall of the gorge. I realized that I had probably not brought enough water. And I’d neglected to carry my usual bottle of iodine tablets. 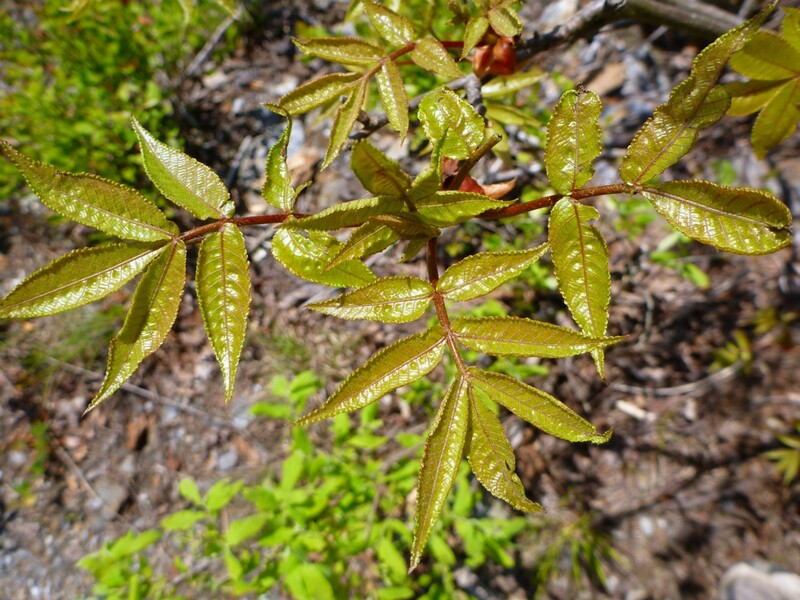 Beware of the luxuriant poison ivy all along the first section of the trail. It finally fades out above 3000′. Once the trail reaches the rim, it traverses over to the valley of Ledbetter Creek. 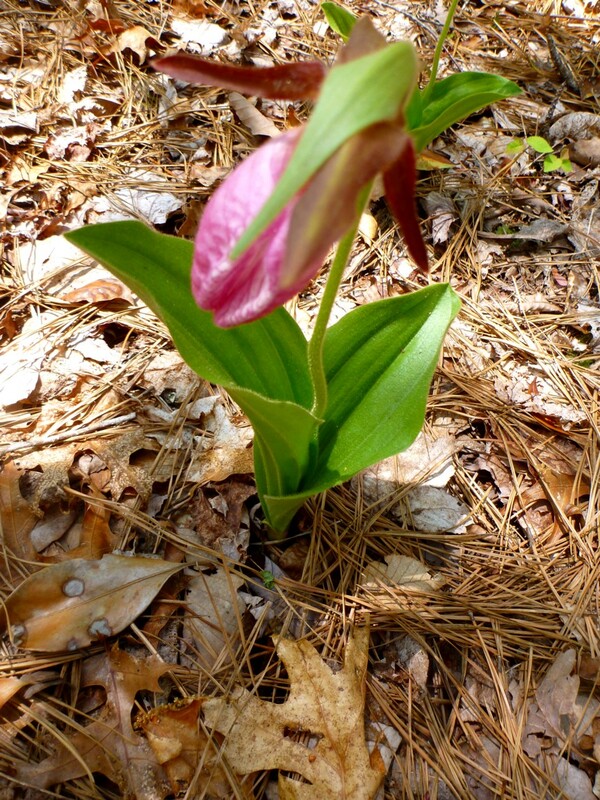 At the high point of the traverse, I saw my first ladyslippers of the season. 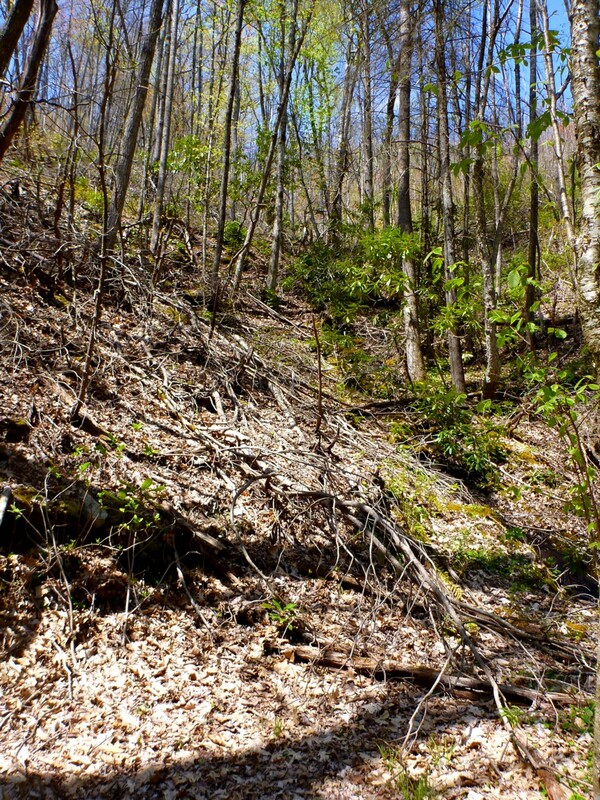 The trail then makes one of its discouraging descents. But a colorful spattering of wildflowers along the way softened the realization that this would be a tougher hike than I’d anticipated. I arrived at Ledbetter Creek, which the trail crisscrosses for the next couple of miles, passing through rubbly areas and making numerous small climbs and descents. 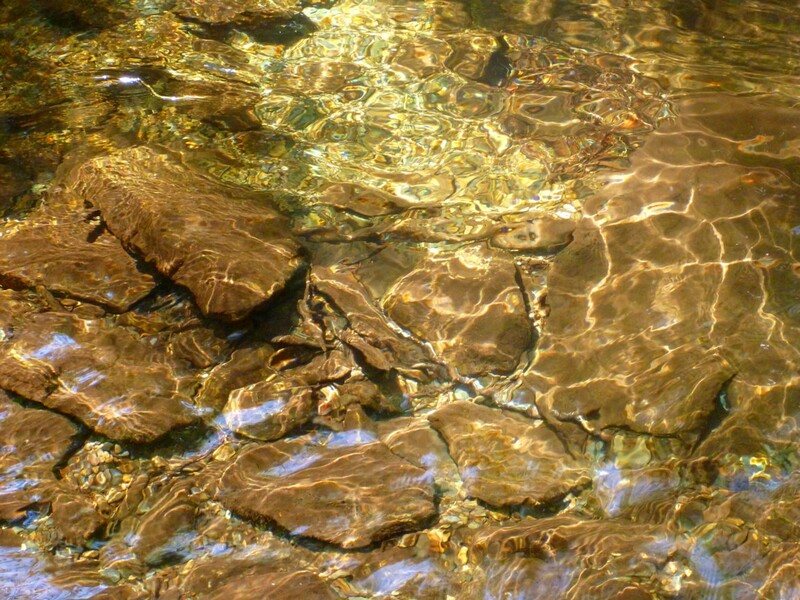 I’ve become fixated with the patterns of light in streamwater. The wildflowers continued their kaleidoscopic progression. 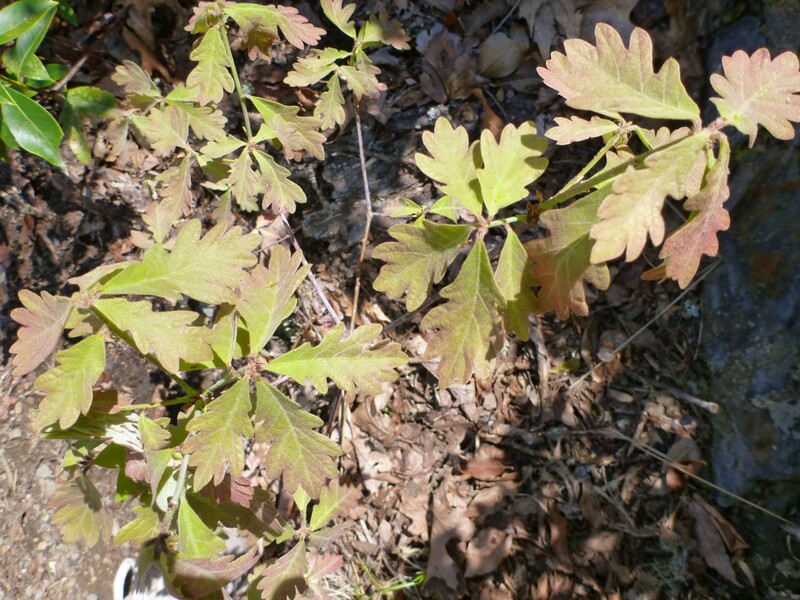 It amazed me how well various plants were coming back in the burned areas. The area has been battered by ice storms as well as by fire. This devastation zone may date to the harsh winter of 2009-2010. 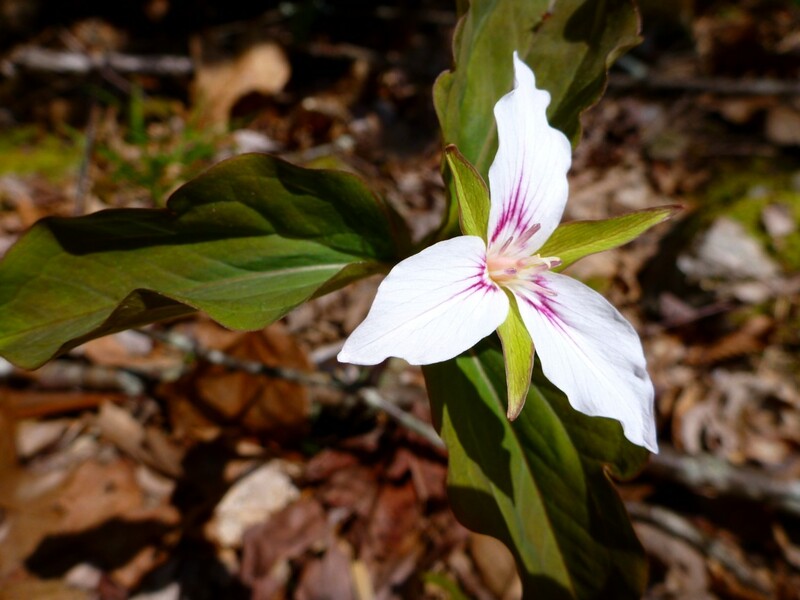 I saw a painted trillium, one of my favorite wildflowers. Three miles in, I reached Bartram Falls. It has a lower section and an upper section. 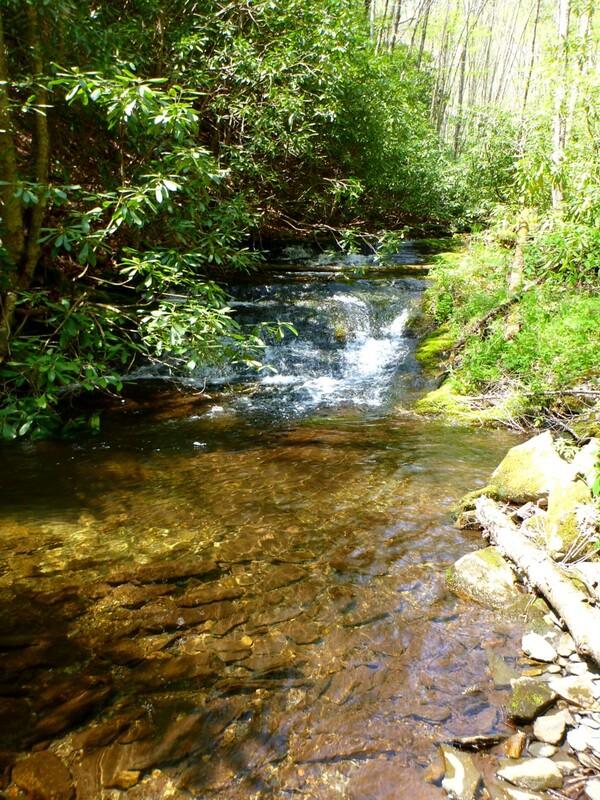 The lower has the major drop of the waterfall, but the upper features some interesting sluiceways between large rectangular blocks of stone. Upper section, featuring water moving among geometric shapes. I liked that. 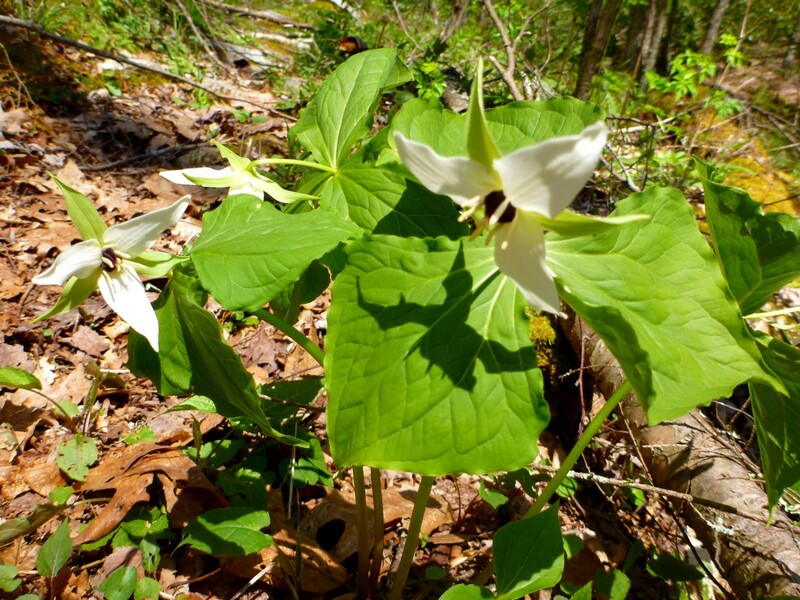 I entered a zone of Sweet White Trillium. My water situation was looking grim to the point that I thought I might have to turn around. 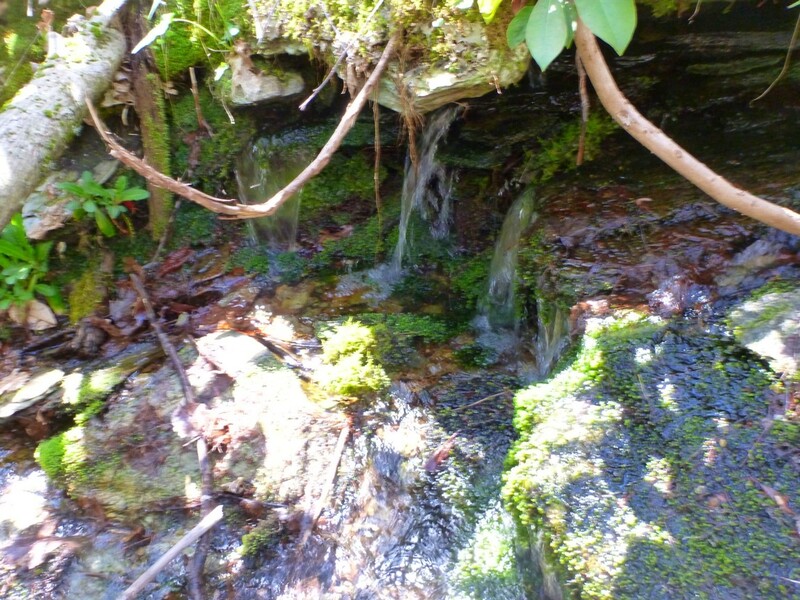 But I explored a bit and found a spring. I refilled my bottle here. Not far above the spring, the trail crosses a forest service road and then tackles the steep climb up to the high ridge of the A.T. 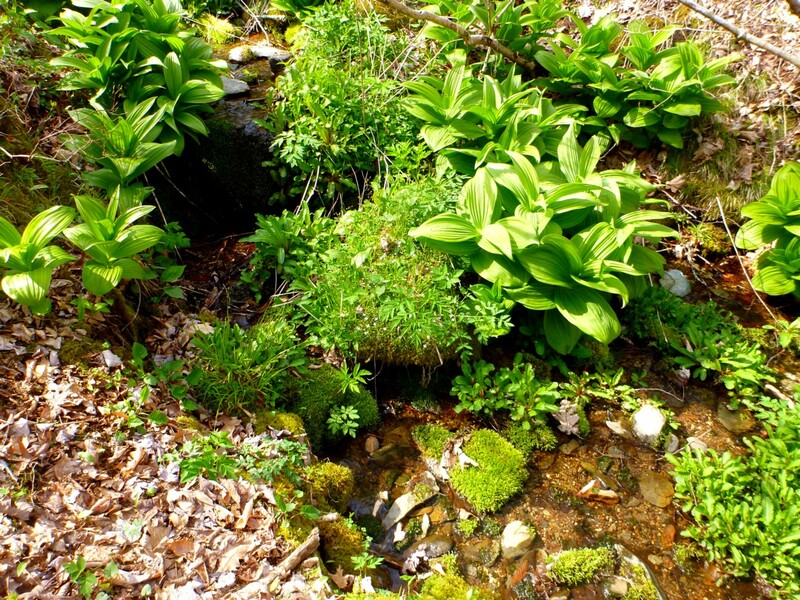 It runs beside a small stream drainage that was filled with the lush greenery of false hellebore. At last I reached the junction with the A.T. and made the final push to the summit. I found two thru-hikers there—it’s so easy to spot them by their giant packs. We chatted for a bit and I enjoyed the view. Be careful there, though. I spotted a tick crawling up my leg, and a day later found another one clinging to my earlobe—it had survived a hot shower! It was time to face up to the trip back. 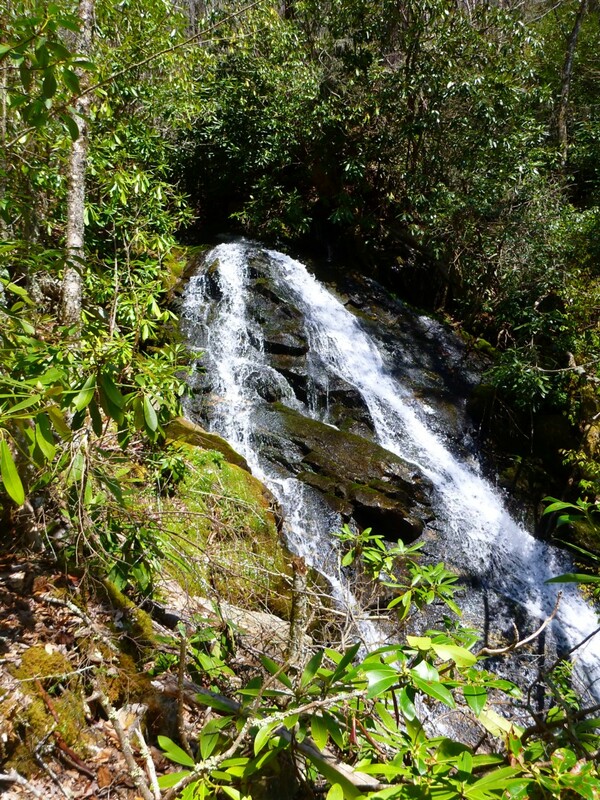 An interesting hike of many contrasts and novel features. I highly recommend it—but start in the cool of the morning, not at 1:00. 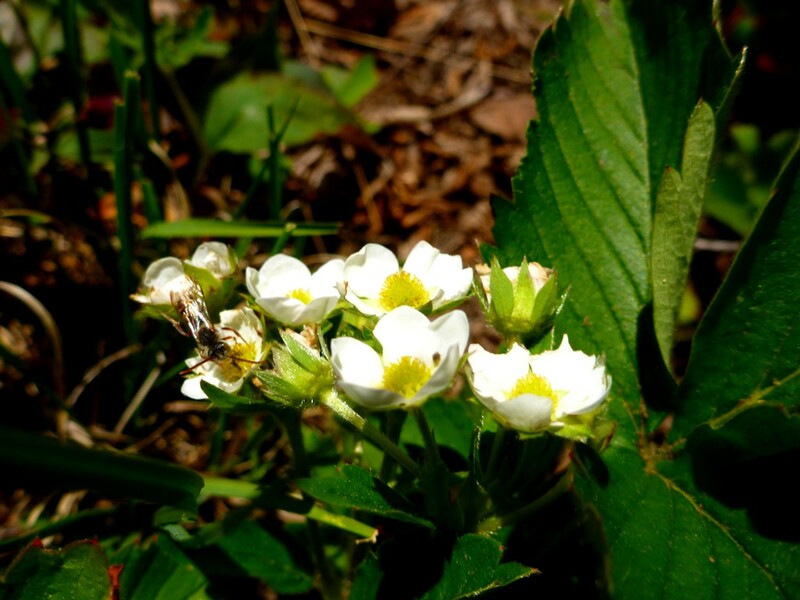 Posted by Jenny in bushwhacking, memoir, Smoky Mountains. 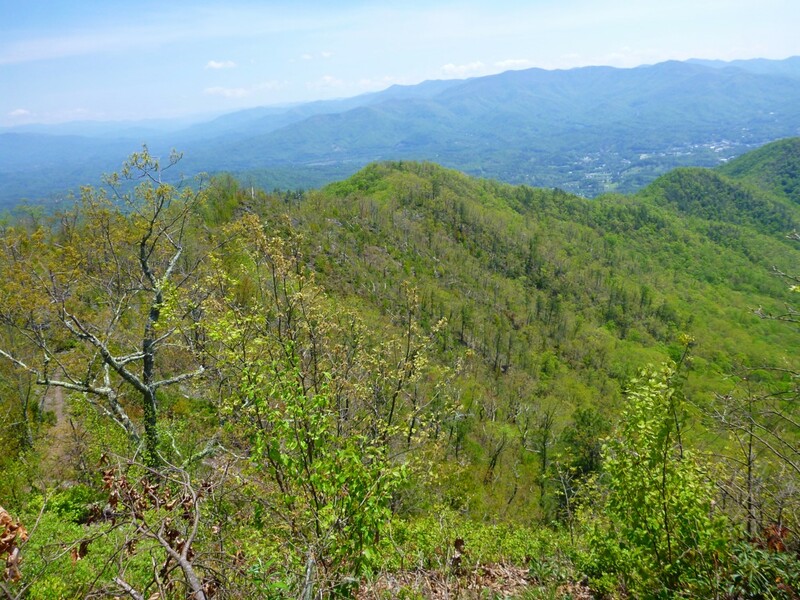 One day, four people set out to reach a certain point in the Smokies. The group consisted of two guys relatively new to off-trail hiking but very fit, a fellow I’ve been hiking with over the past year, and me. The hike was my idea, but our decisions were made jointly—except for one person’s decision when it grew dark. The total elevation gain for the day was 4700′, most of it off-trail. We hiked four miles on a trail and climbed 1100 vertical feet, dropped off the trail via a manway and lost 1800′, climbed 2100 feet off trail, reached a point where the group decided it was dangerous to go higher, backtracked down 1000′, climbed 1100′ up a familiar route, dropped 100′ to a trail, climbed 400′, and finally descended 1200′ to our starting point. Why did we backtrack so far? Because it looked easier than traversing directly over to the familiar route—a debatable point. When we climbed up the familiar route to regain our elevation, I became exhausted. 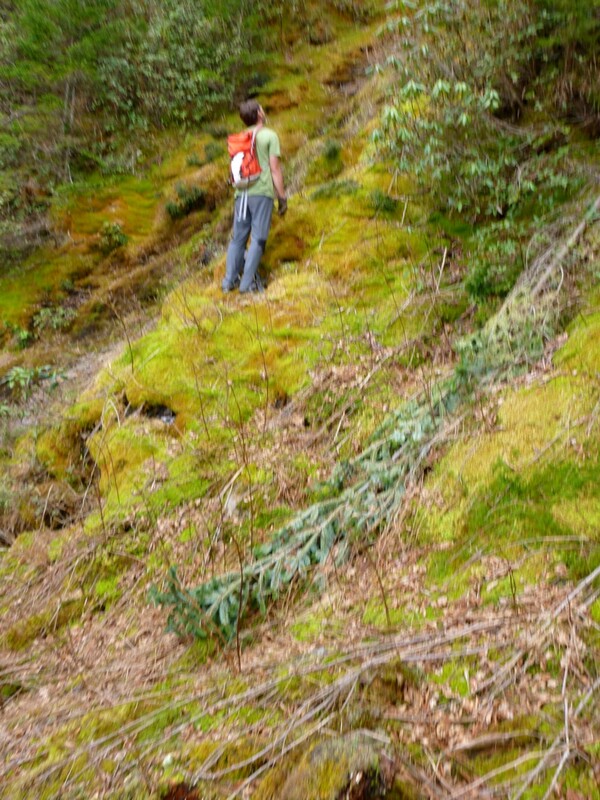 We had been on terrain that was incredibly steep, hanging onto roots, rocks, and branches, and I was simply worn out. Part of it was the upper body strength required—I just don’t have the arm muscle. I can honestly say that I have never been so tired in my life, not after climbing Mt. Whitney as a day hike, not after doing the Presidential Traverse in the White Mountains. After doing all kinds of hard hikes, I had finally reached my limit. My pace slowed dramatically. I fell behind the group as we climbed up the familiar route. It was growing dark. I turned on my headlamp and proceeded as best I could through steep tangles of brush and blowdown. I knew which way to go, but it was hard negotiating the obstacles in the headlamp’s narrow beam. I heard voices at the top of the ridge—they were calling me. It took me a long time to zero in on them. 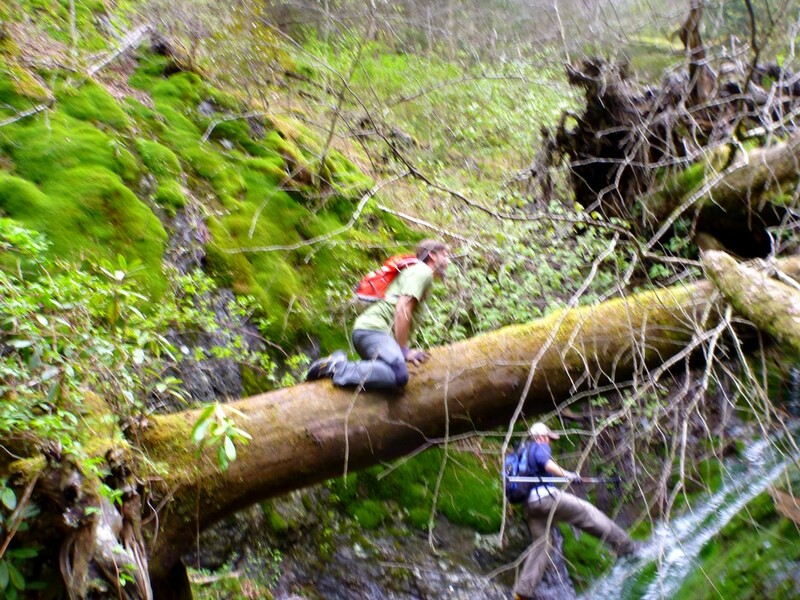 It was just the two guys new to bushwhacking, and neither one had a headlamp. The fourth person, who had one, had departed, concerned that his girlfriend was getting worried, and leaving the other two sitting in dense forest, off-trail, in the dark. Using my compass, I navigated the way to the trail, with the two others following. We reached the trail and made our last climb of the day. I was so exhausted that my legs wobbled. The two guys were good sports about my slow pace, and they kept up a cheerful conversation until we finally reached our destination. I am extremely grateful to them. I would have made it out without them, but it was much more pleasant to have their company. The irony was that they were in much better shape at that point than I was, but they might not have made it out that night if I hadn’t had the headlamp and compass. You might think I’d decide not to do this stuff any more, but no, I’ll keep doing it. These places are too valuable to me to give them up. And after all the adventures I’ve had out there, it was simply a statistical likelihood I’d have an experience like this at some point. But I will try to keep it within my own personal limits.